We all have crazy families. We don’t all have to write 400 page books about them. 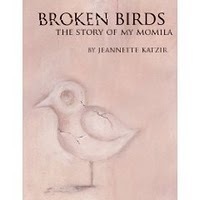 In Broken Birds: the Story of my Momila, Jeannette Katzir describes her family saga, from pre-Holocaust days to the present. Through the births and deaths and marriages and divorces, Katzir tells her perspective on all of life’s triumphs and tragedies, from the old country to LA. Within the book Katzir is a vulnerable narrator; she frequently finds herself subject to confusing parental neuroses or in the middle of painful sibling feuds. Her woes are familiar, especially from an Ashkenazi perspective, and most of them reveal a pattern of family sticking together during times of adversity but falling apart during prosperity. In her effort to untangle her family’s story, Katzir explains the history of several generations in a biased and un-self-aware voice. She trusts that the reader will relate to the plot enough to remain interested in the years and years of background information she provides. The issue here is not really length; it’s style. The prose plods along, and despite the abundance of rich plot material to work with, Katzir’s memoir never really takes flight. Authors are supposed to convey the excitement of life, the humor, the love, pain, tragedy, or triumph to the reader, but Katzir rarely manages to bring her life to life. The book seems to be written for the author’s benefit rather than the reader’s, and the overall effect is that the book feels like a 372 page email to the writer’s therapist. That’s not to say the book is entirely without merit. There are a few scenes where the writing does not take away from the content, and the beauty of pivotal life moments shines through. A passage describing Katzir’s excitement at having her first child is thrilling, and some of the scenes immediately surrounding Katzir’s mother’s death are truly heart-wrenching. During the best moments the book feels like family history recounted by a very knowledgeable aunt; however, there’s a limited amount of time I can listen to my own family, much less someone else’s. Though I’m sure Katzir tells wonderful stories at home, her life does not come through enough in her writing, and simply put, her book is not well written. Click here to read a preview of the book from the author’s website.